This example of noise reduction algorithms uses Welch’s method  to create an estimate of the noise-only power spectral density to estimate the a priori signal to noise ratio. A soft-decision voice activity detector is implemented using the a priori estimate in a log-likelihood ratio test as as in . A suppression rule is then derived following the methods of  and used in accordance with the voice activity hypothesis to provide an estimate of the clean speech signal. ned as y(t) = x(t) + d(t). 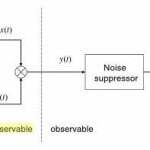 That is, the noise signal is assumed to be additive and unncorrelated with the speech signal. Now the observed noisy speech signal is simply a linear combination of the clean speech and noise. Thinking about these unobservable signals as random variables, their pairwise uncorrelation then grants us the ability to use linear maps into the other practically important signal domains. For instance, the frequency domain transform results in Y (ω) = (X +D)(ω) = X(ω)+D(ω). Both noise and speech are generally assumed to be N(0, σ) due to the central limit theorem , but some processing systems report better results modeling the speech as L(0, σ)  or Γ(k, θ) . The figure illustrates, we only have access to the noisy speech signal. Thus, a speech enhancement system’s job is to accurately estimate these unobservable signals. To do this, it is of utmost importance to accurately estimate the noise power spectral density because it is needed to define a posteriori signal to noise ratio (SNR), to estimate the a priori SNR, and through those two estimators, derive the system’s suppression rule G. Thus, the quality of the entire system is dependent on the accuracy of the Noise Power Spectral Density Estimator. The first and most important major block in a speech enhancement system is the Noise Power Spectral Density Estimator. 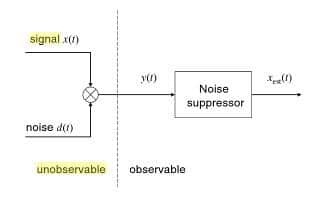 Ideally, we would be able to sample the noise signal continuously in real time, however, in practice we must sample the noise PSD at discrete time intervals, and thus we need to derive a scheme to update the noise PSD as the speech is being processed. A variety of update schemes have so far been proposed in the literature. The earliest methods simply assumed a pause in speech as in , resulting in the observed signal being only noise. From this noise only data, they could then estimate the PSD. When another noise only frame was detected, the noise PSD could be updated. The next advancement came from the Minimum Statistics approach , which works from the assumption that the minimum power level in any given frequency bin when observed over a sufficiently long period represents the power in the noise signal. Therefore, we no longer need to wait for a pause in speech to update the PSD estimate. Instead, we can just look for the minimum power level within a frame. Most recently, subspace approaches have invaded the frequency domain, and we now have Noise Tracking using DFT Domain Subspace Decompositions . This approach appears better at tracking non-stationary noise than Minimum Statistic, as it does not need to search the entire frame for the minimum power. It also seems to be better at following noise PSD changes when speech is consistently present in a bin due to its subspace nature. Where L is the STFT size, ME = xL, x ϵ [0, 1] denotes the frame shift factor, and w represents the window function. The next stage in a speech enhancement system is the calculation of the a posteriori signal to noise ratio and the estimation of the a priori signal to noise ratio. The SNRs always define the system’s suppression function, which is used to clean up the speech signal by attenuating the noise, and so it is important to have an accurate result from these computations. The a posteriori SNR calculation is straightforward, however since we cannot observe the clean speech signal, accurate a priori SNR estimation is not a trivial task. The frame a priori SNR is defined similarly as (8). Since we cannot observe the clean speech signal, we need to utilize an estimator of the a-priori SNR. There are various schemes to do this, but it all started in 1984 when Ephraim and Malah  first derived a real time a-priori SNR estimator. In our example, this is the estimator used. The weight is chosen according to the level of stability your algorithm requires. You can effectively filter out disrupting transients arising from abrupt changes in the current frame’s a posteriori SNR by choosing α ~ 1. In effect, you are then weighting the previous frame’s statistics more highly and thus introducing a frame lag for stability. In the presence of highly non-stationary noise, it might be better to choose α ~ 0 to weight the current frame’s statistics more highly so that changes in the SNR can be better tracked. Notice how all SNRs depend on the noise signal’s power, which illustrates that these measures’ accuracy can be affected by poor tracking of the noise signal’s non-stationary behavior. If these measures are not accurate, then the suppression rule will not be accurate either, and the system’s ability for speech enhancement will be compromised. Therefore, it is of optimal importance to always have an accurate estimator of the true noise PSD. Classically, the SNRs were used to determine the presence of speech in an algorithm called a Voice Activity Detector (VAD) . A VAD is an algorithm that decides on the presence or absence of speech in a given signal frame. A statistical-based VAD compares some function of the SNRs called the likelihood ratio to a threshold value. If this likelihood ratio exceeds the threshold, one hypothesis on the presence of speech is taken to be true, while the other is if the likelihood ratio falls short. If the VAD decides that speech is absent, then a noise only frame has been found, and the noise PSD can be updated. The need for a VAD comes from the nonstationarity of the noise signal. Once one estimate of the noise PSD is computed, it cannot be assumed that the noise will forever be described by this PSD. Indeed, the changing statistics of the noise as a function of time demand accurate time domain tracking of the noise PSD to ensure proper quality of the enhanced speech signal. In essence, a suppression rule is a frequency bin specific gain function applied across the spectrum of the noisy speech signal in order to suppress the bins containing primarily noise while keeping speech dominated bins intact, thus resulting in an estimation of the spectrum of the clean speech signal. The clean speech signal can then be expressed as: X(ω ) = G(ξ, γ, ω ) Y (ω) where G is the suppression rule. Scalart P. “Speech Enhancement Based On A Priori Signal To Noise Estimation.” IEEE International Conference on Acoustics Speech and Signal Processing, 1996, pp.629-632. Martin R. “Speech enhancement using MMSE short time spectral estimation with Gamma distributed speech priors,” Proc. IEEE Int. Conf. Acoustics, Speech, Signal Processing, ICASSP ’02, Orlando, Fla, USA, May 2002. Sohn, J., Kim, N., Sung W. “A statistical model based voice activity detector.” IEEE Signal Processing Letters, 1999, pp.1-3. Ephraim Y., Malah D. “Speech Enhancement Using a Minimum Mean-Square Error Short-Time Spectral Amplitude Estimator” IEEE Transactions on Acoustics, Speech, and Signal Processing, vol. ASSP-32, pp.1109-1121, Dec. 1984.